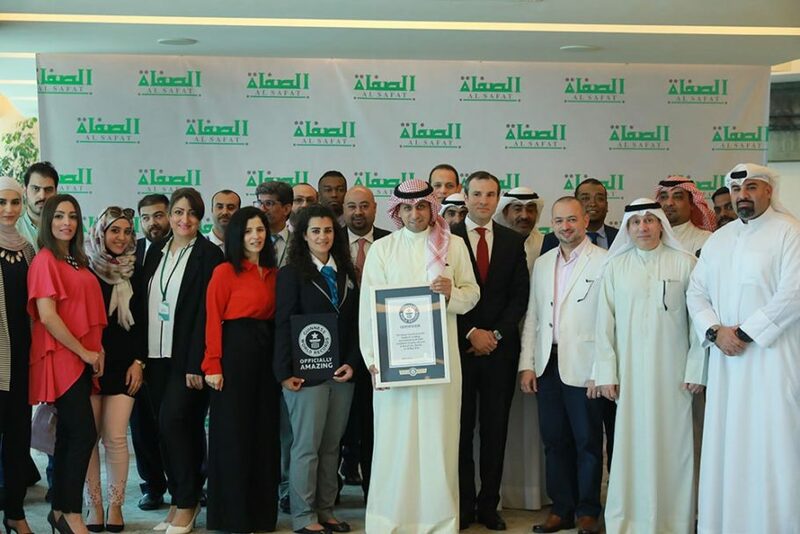 Al-Safat Investment Company broke the record on Thursday (10th May 2018) for designing and executing the world’s ‘Largest Vinyl-Decal Sticker in the World’ on Safat Tower in Hawally district. 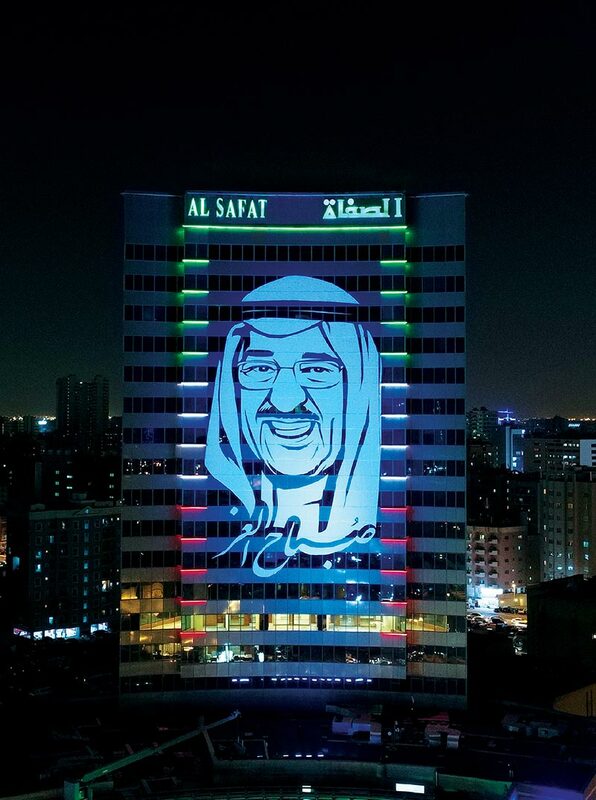 The sticker itself named “Sabah Al-Ezz” translates to “Sabah of Pride” and has His Highness the Amir Sabah Al-Ahmed Al-Jaber Al-Sabah’s portrait. Furthermore, an adjudicator from Guinness World Records visited Kuwait to check the measurements of the sticker, along with an independent team of surveyors and engineers validating the record, thereafter announcing that Al-Safat Investment Company broke the world record of 830 square meters, as the sticker that Al-Safat put up was 937 square meters, an increase of 107 from the previously held record. It should be noted that Al-Safat Investment created the aforementioned sticker in February 2018 to celebrate the National and Liberation days and that His Highness the Amir’s portrait was chosen for the occasion to appreciate his efforts in all aspects, especially modernizing the economy and developing it. Chairman of the Board of Directors for Al-Safat Investment Company, Abdullah Hamad Al-Terkait said that the company worked diligently for several months to document this achievement, which is presented to His Highness the Amir, as part of the company’s corporate social responsibility plan to support society in general and youth particularly. Amir’s 2035 vision (New Kuwait) that both the private and public sector partner together to implement. In terms of youth empowerment, Al-Terkait said that youth make up more than 70 percent of Kuwait’s population and empowering them is the responsibility of everyone, especially institutions that deal with them directly such as the SME Fund, Ministry of Youth Affairs and the Public Authority for Youth, noting that he’s happy that there’s a trend of young entrepreneurs in Kuwait, creating businesses and jobs for themselves, adding that it’s a sign of high economic awareness and that it is the private sector’s role to support them. Al-Terkait added Al-Safat Investment is studying the establishment of, or participating in an investment fund that supports young entrepreneurs and captures opportunities in mainly, the “tech field”. He described this particular field as having returns that sync with the company’s medium-long term investment strategy, saying that the group’s subsidiary and affiliate companies can support these opportunities and provide service packages that lower their operational costs, thus increasing profitability. Referring to the business environment, he added that amending regulations to improve the business sphere, is an urgent matter specifying the law governing the SME Fund, insolvency and bankruptcy laws, commercial registrar and auditors law, pointing to the importance of supporting the industrial sector and national industries, to compete regionally as that sector is essential for economic development. Moreover, Al-Terkait stated that some government mechanisms relating to business, need to substantially improve, like using information and communication technologies to make it easier and faster to process applications and provide better services. He added that the ‘New Kuwait 2035’ vision aims to transform Kuwait, into a commercial and financial hub to bring foreign investment, to the country where the private sector would be the economic leader, assuring that competition between different sectors would improve productivity in an institutionally governed country. Furthermore, Chairman Al-Terkait noted that HH the Amir’s efforts to modernize the economy, paved the way for the National Program for Economics and Financial Sustainability, which leads the way to improve the business sphere. He also added that increased competition in the private sector will not happen unless, the economy is diversified away from oil. Additionally, Al-Terkait stated that, the program can increase employment by 70,000-10,0000 Kuwaitis by the end of 2021, if competent planning and efficient employment is implemented and supplementing it with good governance, in addition to categorizing jobs to fit the needs of the economy. Al-Terkait also stressed the need to boost foreign direct investment, to promote and finance small-medium businesses before motivating public-private partnerships and finally to set clear deadlines to privatization, restructuring and reorganizing production sectors.